A lung abscess is a subacute infection that destroys lung parenchyma. Furthermore, chest radiographs reveal one or more cavities, often with an air-fluid level. Because the development of a cavity requires some amount of prior tissue damage and necrosis, it may be presumed that lung abscesses usually begin as a localized pneumonia. Before the availability of antibiotics, a typical abscess arose from complications after oral surgical procedures (ie, tonsillectomy), resulting in aspiration of infected material into the lungs. In the absence of satisfactory antibiotic treatment, this event usually led to a lung abscess or to a necrotizing pneumonia with or without pleural empyema. In the preantibiotic era, the clinical course of a patient with a lung abscess would gradually worsen. At one time, mortality was in excess of 50%, and many patients were left with significant residual symptomatic disease. Most patients underwent surgery during the latter stages of the disease, and the results were discouraging. The availability of effective antibiotic therapy for primary lung abscess has drastically modified the natural history of the disease and diminished the role of surgery. In current practice, operative indications are less frequent, and these procedures are undertaken electively for chronic illnesses only after medical therapy has been unsuccessful. In addition to antibiotics, pulmonary care has advanced and now includes postural drainage. Currently, bronchoscopy is occasionally employed as an adjunct to expedite drainage and to identify underlying occult lesions such as foreign bodies and malignancies. The increasing use of corticosteroids, immunosuppressive drugs, and chemotherapeutic agents has changed the natural milieu of the oropharyngeal cavity and contributed to the mounting frequency of opportunistic lung abscesses. For patient education resources, see the Infections Center, Lung and Airway Center, Pneumonia Center, and Procedures Center, as well as Bacterial Pneumonia, Abscess, Antibiotics, and Bronchoscopy. 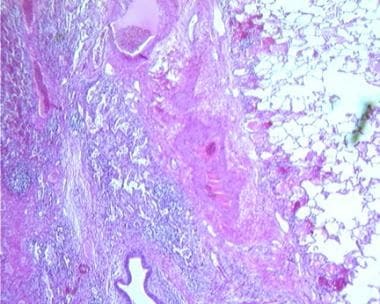 Aspiration of infectious material is the most frequent pathogenetic mechanism in the development of pyogenic lung abscess. Aspiration due to dysphagia (eg, achalasia) or to compromised consciousness (eg, alcoholism, seizure, cerebrovascular accident, or head trauma) appears to be a predisposing factor. Poor oral hygiene, dental infections, and gingival disease are also common in these patients. Patients with alcoholism and those with chronic illnesses frequently have oropharyngeal colonization with gram-negative bacteria, especially when they undergo prolonged endotracheal intubation and receive agents that neutralize gastric acidity. A pyogenic lung abscess can also develop from aspiration of infectious material from the oropharynx into the lung when the cough reflex is suppressed in a patient with gingivodental disease. Abscesses generally develop in the right lung and involve the posterior segment of the right upper lobe, the superior segment of the lower lobe, or both. This is due to gravitation of the infectious material from the oropharynx into these dependent areas. Initially, the aspirated material settles in the distal bronchial system and develops into a localized pneumonitis. 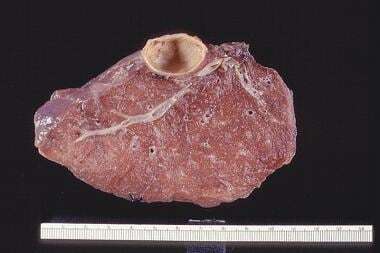 Within 24-48 hours, a large area of inflammation results, consisting of exudate, blood, and necrotic lung tissue. The abscess frequently connects with a bronchus and partially empties. Histologic evaluation of lung abscess shows dense inflammatory reaction (low power). Lung abscesses have numerous infectious causes. Anaerobic bacteria continue to be accountable for most cases. These bacteria predominate in the upper respiratory tract and are heavily concentrated in areas of oral-gingival disease. Other bacteria involved in lung abscesses are gram-positive and gram-negative organisms. Shinzato T. [Effects and management of odontogenic infections on pulmonary infections]. Yakugaku Zasshi. 2009 Dec. 129 (12):1461-4. [Medline]. O'Donnell CP, Landzberg MJ, Mullen MP. Lung abscess in adults with tetralogy of fallot and pulmonary atresia. Cardiol Young. 2010 Feb. 20 (1):91-3. [Medline]. Magalhães L, Valadares D, Oliveira JR, Reis E. Lung abscesses: review of 60 cases. Rev Port Pneumol. 2009 Mar-Apr. 15 (2):165-78. [Medline]. Huang HC, Chen HC, Fang HY, Lin YC, Wu CY, Cheng CY. Lung abscess predicts the surgical outcome in patients with pleural empyema. J Cardiothorac Surg. 2010 Oct 20. 5:88. [Medline]. Ando K, Okhuni Y, Matsunuma R, Nakashima K, Iwasaki T, Asai N, et al. [Prognostic lung abscess factors]. Kansenshogaku Zasshi. 2010 Jul. 84 (4):425-30. [Medline]. Schweigert M, Solymosi N, Dubecz A, John J, West D, Boenisch PL, et al. Predictors of Outcome in Modern Surgery for Lung Abscess. Thorac Cardiovasc Surg. 2017 Oct. 65 (7):535-541. [Medline]. Bartlett JG. Antibiotics in lung abscess. Semin Respir Infect. 1991 Jun. 6 (2):103-11. [Medline]. Unterman A, Fruchter O, Rosengarten D, Izhakian S, Abdel-Rahman N, Kramer MR. Bronchoscopic Drainage of Lung Abscesses Using a Pigtail Catheter. Respiration. 2017. 93 (2):99-105. [Medline]. Shlomi D, Kramer MR, Fuks L, Peled N, Shitrit D. Endobronchial drainage of lung abscess: the use of laser. Scand J Infect Dis. 2010. 42 (1):65-8. [Medline]. vanSonnenberg E, D'Agostino HB, Casola G, Wittich GR, Varney RR, Harker C. Lung abscess: CT-guided drainage. Radiology. 1991 Feb. 178 (2):347-51. [Medline]. Duncan C, Nadolski GJ, Gade T, Hunt S. Understanding the Lung Abscess Microbiome: Outcomes of Percutaneous Lung Parenchymal Abscess Drainage with Microbiologic Correlation. Cardiovasc Intervent Radiol. 2017 Jun. 40 (6):902-906. [Medline]. Kelogrigoris M, Tsagouli P, Stathopoulos K, Tsagaridou I, Thanos L. CT-guided percutaneous drainage of lung abscesses: review of 40 cases. JBR-BTR. 2011 Jul-Aug. 94 (4):191-5. [Medline]. Hecker E, Hamouri S, Müller E, Ewig S. [Pleural empyema and lung abscess: current treatment options]. Zentralbl Chir. 2012 Jun. 137 (3):248-56. [Medline]. Alifano M, Gaucher S, Rabbat A, Brandolini J, Guinet C, Damotte D, et al. Alternatives to resectional surgery for infectious disease of the lung: from embolization to thoracoplasty. Thorac Surg Clin. 2012 Aug. 22 (3):413-29. [Medline]. Sziklavari Z, Ried M, Hofmann HS. Vacuum-assisted closure therapy in the management of lung abscess. J Cardiothorac Surg. 2014 Sep 6. 9:157. [Medline]. Sziklavari Z, Ried M, Hofmann HS. [Intrathoracic Vacuum-Assisted Closure in the Treatment of Pleural Empyema and Lung Abscess]. Zentralbl Chir. 2015 Jun. 140 (3):321-7. [Medline]. Nagasawa KK, Johnson SM. Thoracoscopic treatment of pediatric lung abscesses. J Pediatr Surg. 2010 Mar. 45 (3):574-8. [Medline]. Arai H, Inui K, Watanabe K, Watanuki K, Okudela K, Tsuboi M, et al. Lung abscess combined with chronic osteomyelitis of the mandible successfully treated with video-assisted thoracoscopic surgery. Clin Respir J. 2015 Apr. 9 (2):253-6. [Medline]. Lateral chest radiograph shows air-fluid level characteristic of lung abscess. Chest radiograph reveals lung abscess occurring as complication of necrotizing pneumonia. CT reveals lung abscess with air-fluid level occurring as complication of necrotizing pneumonia.